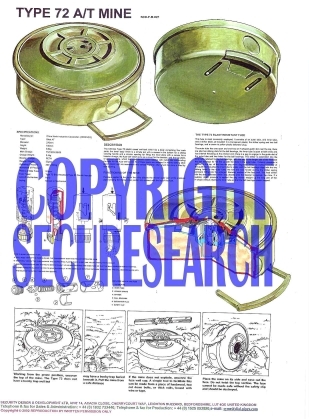 This security poster illustrates the Type 72 China Anti-Tank Mine. This anti-tank mine has a plastic cased mine body with minimum metal content. The mine uses a blast resistant fuze to counteract blast over pressure systems. This security poster features illustrations and descriptions on how to disarm the Type 72 anti-tank mine, the top and bottom views of the Type 72 anti-tank mine, a sectioned Type 72 anti-tank mine, a full-sized view and a sectioned view of the Type 72 Blast fuze, illustrations detailing the effects of sudden pressure and steady pressure on the Type 72 blast fuze, and an exploded view of the fuze with labelled parts. This security poster also shows the technical specifications, the description, the functioning of the mine, and the Type 72 blast resistant fuze of the Type 72 Anti-Tank Mine. The top and bottom views of the Type 72 anti-tank mine. A sectioned Type 72 anti-tank mine. Illustrations detailing the effects of sudden pressure and steady pressure on the Type 72 blast fuze. An exploded view of the fuze with labelled parts. Illustrations and descriptions on how to disarm the Type 72 anti-tank mine. The technical specifications, the description, the functioning of the mine, and the Type 72 blast resistant fuze of the Type 72 Anti-Tank Mine. This security poster features illustrations and descriptions on how to disarm the mine, the top, sectioned, and bottom views of the mine, a full-sized view and a sectioned view of the fuze, illustrations detailing the effects of pressure on the fuze, and an exploded view of the fuze.